With Sirchie® law enforcement professionals receive convenience, practicality and a quality that stands the test of time and holds up to the demands of any crime scene. The Kraft Evidence Bag includes a printed form with ample space to document all identifying information on specimens as well as the path it takes from collection point to the lab and beyond. 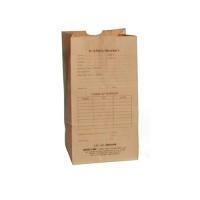 The Evidence Bag's durable material breathes and resists rips and tears from casual handling. Sirchie® offers evidence integrity tape to seal the bags and prevent tampering. Each pack contains 100 bags.